It Just Takes 5 Minutes – Do It Yourself! When you get a car from a local car dealer (usually when you get a used car), the dealer puts their sticker on the trunk or somewhere to help promote their dealership and tell others where you got your great car. The good thing is that you don’t need to have this dealership sticker on your car or truck and it’s actually really easy to remove – it’ll take maybe 5 minutes or so! Above, I’m showing the before and after pictures when I did it on my car. It really only took about 5 minutes and I was completely done. I wish I would have done this earlier. I guess I thought the decal would still show through somehow or that the paint maybe faded and I still would have seen the logo on the car since the paint under it had been protected more but no – there’s absolutely no indication that the dealership sticker was ever there! First make sure the area is clean. Next, plug in the hair dryer and you’re going to warm the sticker up. Turn it on high and go over the sticker area for 30 seconds to a minute. Next, get your credit card out (or even use your finger nails) and peel away the dealer decal. It should be nice and warm now and come off pretty easily. Keep working at it until you get the major parts of it removed (as much of it as you can). Once it’s gone, there will be some sticky residue. What I like to use is Goo Gone. This stuff works really well and it something good to have around the house to remove sticker residue from price tags or whatever – so it’s worth just having a bottle of this stuff around the house. Spray the area, let it sit a few seconds and then wipe it. If there is still some residue, then spray it again and wipe. It should all come off. Unless the sticker has been on there a really long time, it should have come cleanly off and you shouldn’t be able to tell it was even there. Removing these stickers is easy. Really anyone can do it, so there’s no reason to pay an auto detailer money to do it. You’re also increasing the value of your car because it looks cleaner to a buyer who comes to look at it. That’s your goal – to have as clean of a car as you can and one that looks as close to new as possible. This will help the buyer visualize them self in it, driving it and owning it. Sometimes seeing something done helps you understand how to do it better. It makes more sense than reading some instructions – most of us are more visual learners anyway. Below, you will find a video showing you how to remove dealer stickers from your car – just follow what he does and, along with the instructions here, you’ll have that decal removed in no time! You may also have some stickers on the glass of your car (like the windshield) that you might want removed. Doing it is easy, too. 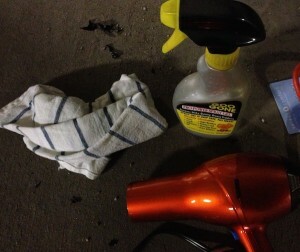 You might as well do this task at the same time and get the car totally clean. This can include parking stickers, state park stickers or even residue from your state’s toll road unit that you stick onto your windshield. You’ll first spray down the sticker and area with a good amount of window cleaner. I like to soak the area pretty well. Next, use your razor scraper to remove the sticker. Start at an edge and slowly scrape. You may need to apply more window cleaner a few times but it should all come off. When you scrape the glass, you’re not damaging it – the glass can take it. Use paper towels to clean up and you’re done! If there’s still a little residue, then either keep scraping or else try some of the Goo Gone and that should clean it all up for sure. There’s really no need to have these stickers on your car. They just clutter it up. By removing them, you clean up the appearance of your car and make it look nicer. This, of course, applies to a car you’re trying to sell and the next one you pick up from a dealer or a used car lot. I hope this article helped you. If it did, let us know and leave a comment. If we forgot something or if you have a tip that will help others, please leave that below. Don’t forget to share this article with others! This entry was posted in Car Exterior Tips and tagged auto dealership decals, car detailing, car detailing steps, car detailing tips, car detailing tips and tricks, goo gone, how to remove a dealership sticker, how to remove dealer decal, how to remove dealer sticker from car, remove auto dealer decals, remove car dealer decals, remove dealer emblem from car, remove the dealer sticker from your car by TC. Bookmark the permalink.